Box Dimensions (LxWxH) 4.6 x 4.6 x 2.4"
HB-7 Bayonet Lens Hood is rated 4.6 out of 5 by 86. Rated 3 out of 5 by Prestidigit4 from Stays on better, but too short I am using this on the 70-200mm 2.8 Nikon and I spent a little extra money for the Nikon after I kept losing a knock-off brand that didn't stay on well and was constantly falling off.The best thing is that it bayonets on tight and doesn't come off.The worst thing is it is too short. I may DIY something to make it longer as I get unwanted lens flare even in pretty basic situations where I shouldn't and have to use my hand to kill the flare and this lens is pretty heavy to be doing that. I see there is another hood that is longer for $ which is getting a little pricey to keep stray light out. I may prowl used listings. Rated 4 out of 5 by Brad from Works as intended! Hood works as intended. It is easy to attach and limits stray light from reflecting off the filter and lens. It is fairly long and extends the total length of the lens/camera combination. As always, for a high quality lens such as the Nikon 80-200mm, it would have been appreciated if the lens hood would have been included with the lens and not have to be purchased as an accessory. However, the charge was minimal and after spending the price of the lens for high quality photographs, and I like to make every attempt at getting the best quality pictures as possible. I think this item is necessary to accomplish this. Rated 3 out of 5 by Joseph from works, but comes off too easily I bought this to replace the same item that fell off while hiking in Denali National Park. It disappeared into the tundra ground cover, and I walked a few steps before realizing it had fallen off. After 10 minutes of looking, I gave up; it was gone in the thick tangle of brush. It does its photographic job well, but it comes off too easily, just from rubbing against the body while hiking, with the camera on a neck strap to shoot wildlife. It's also very expensive for a single piece of molded plastic that hasn't changed in 20 years, but that's Nikon! Rated 4 out of 5 by Kanoebilldr from Sturdy, matches lens exterior finish I use this on my Nikon 80-200 for flare reduction and front element protection. It is thick and sturdy and the texture matches that of the lens. The fit on the lens is looser than I expected. It is also pricey for what it is, and really should have been included with the lens. Rated 5 out of 5 by Anonymous from Perfect hood for the 80-200 f/2.8! The matching hood for the 80-200 f/2.8 to reduce flaring. It fits perfect, as usual, but I have to agree that this should've been part of purchasing the 80-200 f/2.8, not a seperate item. Rated 5 out of 5 by DC Photog from Perfect Addition I put off buying this for too long! Colors improve and flare is not a problem at all with this hood. I've noticed better image quality from a lens that was already producing fine images. My only complaint is that it's a hefty price for an item that should have been included with the lens. After all, this is a pro lens with a pro price tag. Rated 4 out of 5 by NJohnston Media from Over priced but does the job What can I say? It's big, strong and blocks light. Does exactly what you want it to. You know you need it if you have the Nikon 80-200 f2.8. It's a little pricey and should totally have come with the lens, but I don't shoot without it. Minus a star for cost. Rated 4 out of 5 by GCA from Good Hood Fits snugly and reverses when you don't need it. Works with filters. Awkward using with the old style pinch caps. Made of plastic, so I'm not sure how long it will last. Overpriced, but if you need it, you need it. Is this a plastic hood? I received the HB-17 hood today, by Dot Line, and it fits a bit sloppy. The hood seems rigid enough but it does not seem to Lock in and stay squarely attached as I would like, and others do. 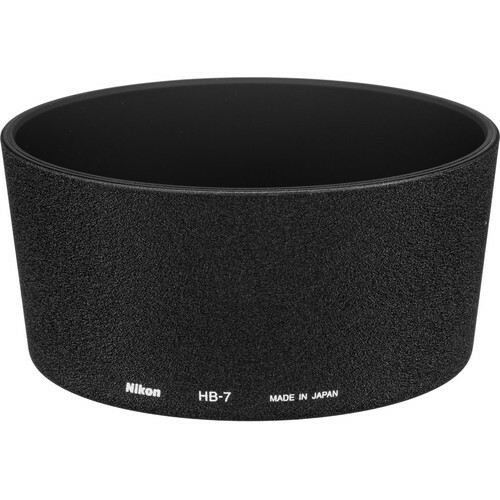 would this hood fit my nikon 80-200 mm 2.8 d len? Yes, the HB-7 will fit the Nikon 80-200mm f/2.8D ED lens. The area that you mount onto the lens is 3 3/8 inches and the diameter of the largest opening on the hood is 4 inches on the Nikon HB-7. will this work with the D7000? I ordered this hood for my 80-200 f/2.8 AF lens. My lens is NOT the AF-D version, it is the AF version. All my research indicated it should fit both lenses, since the AF and AF-D designs are supposedly identical. It has 3 inner ridges that are supposed to mount somehow, but I simply can't figure out where...does anyone know how to mount this hood? On the lense itself there are 3 barely visible grooves, kind of like low stubby T notches. You need to line up the tabs on the inside of the lense hood in-between those notches keeping the cap squared with the lense, then once all the way down gently turn clock-wise and it will lock into place. The hood will seem almost too big until you get it mounted.... If you don't have those 3 notches on your lense this hood may not work for mounting.